We left fairly early on Saturday morning for what should have been a five and a half hour drive from Belgrade. Unfortunately, it appears that everyone else heading out of Serbia and into Croatia and beyond had the same idea. It took us two and a half hours just to reach the Serbian border from the exit toll (!). Long story short, the drive ended up being closer to nine hours and we weren’t exactly in the vacationing mood when we finally arrived at our hotel. We were on the quiet side of the lake on a hill overlooking the water. It was perfect. Lake Bled is also an important venue for rowing, which is surprising, given its small size, and we enjoyed checking out the race course. After a little rest, we went for a walk around the lake, which is much smaller than I had thought, and to grab dinner somewhere. We ended up eating at an adorable little restaurant that had huge portions. I really wanted to taste the infamous “Bled cream cake” but struggled to finish half of my pasta dish (with truffles, of course), so dessert was definitely out of the question. We also tried Malvasia wine for the first time, which we had recently read about in a New York Times article about Istria, Croatia. That night, as we were walking back, we saw tons of stars for the first time in a long time. You don’t really realize how many stars you are until you’re somewhere relatively isolated, without much light pollution. 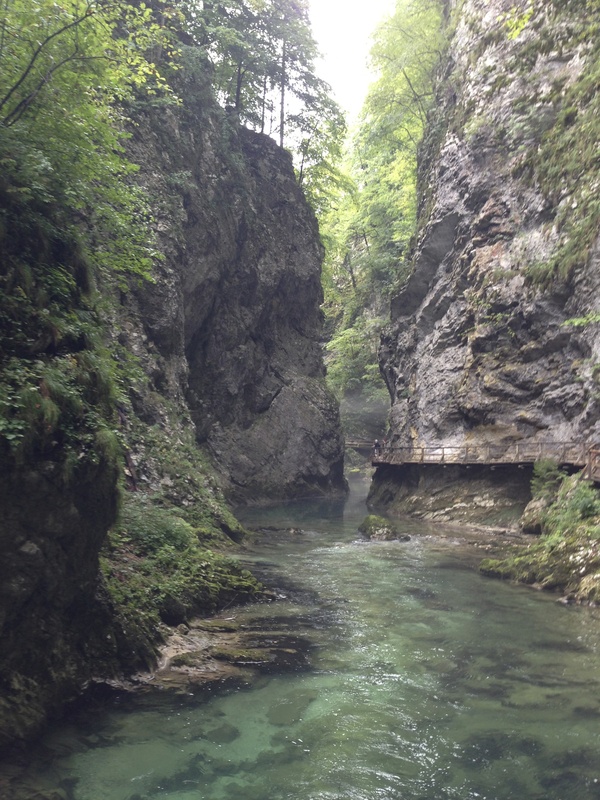 The next day, we went to Vintgar Gorge, which was way cooler than either of us had thought it would be. 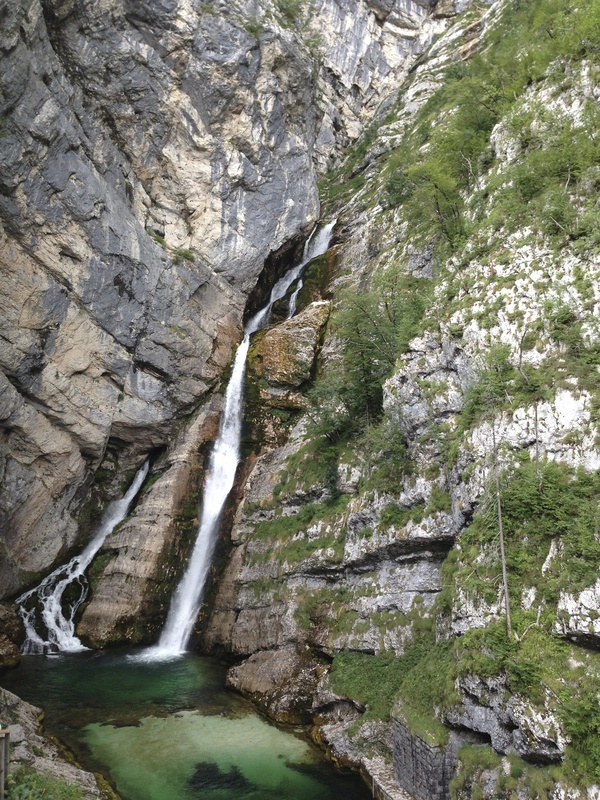 In fact, it reminded us somewhat of the Plitvice Lakes in Croatia. Think crystal clear water flowing through a gorge, with the walking path built into the cliff walls, with a number of bridges thrown in. It is hard to describe and pictures certainly don’t do it justice. Grant had the idea to drive to Bohinj, an area with another lake by the Triglav National Park, located fairly close to Bled. We drove by the lake, which was gorgeous, and went to the Vogel ski resort where we were able to take a gondola up to the top. We hiked around and had traditional Slovene food at a restaurant someone recommended, before heading back to the car. The road leading to and from Vogel was surrounded by an incredible, enchanting forest. I swear I would have seen faeries, had I looked hard enough! As we were driving out of the park, we saw a sign for a waterfall — so we decided to check that out, too. I think there should be a disclaimer posted before buying at ticket and starting the trek to the waterfall: Beware: Lots of Stairs to Climb. Seriously, it felt like they were endless and then, when they finally did end, there was a small viewing place and then it was time to turn around and go down the stairs. That night, we treated ourselves to a decadent dinner at our hotel. We chose to have the fixed price menu, but opted to cut out one course. It was wonderful, and one of the most delicious meals we have had in a long time. I mean, it included both tuna and steak! 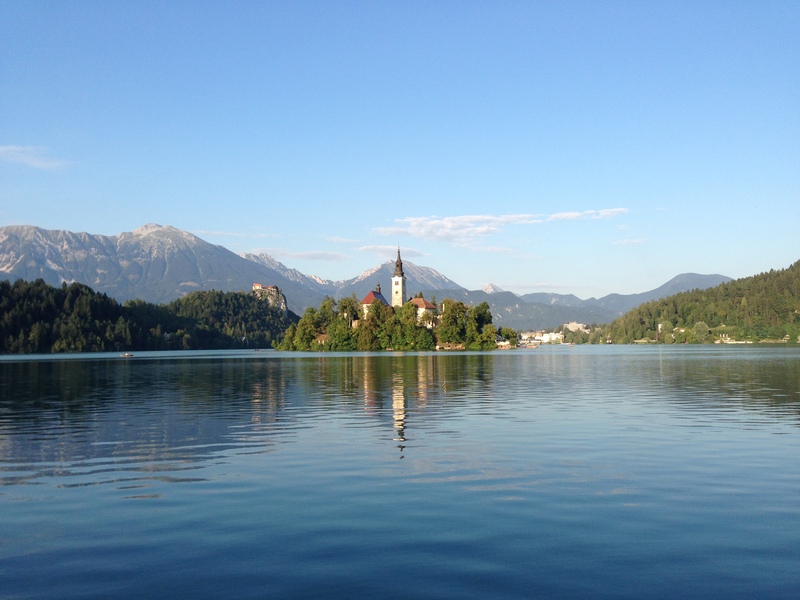 In the morning, we ate our final meal with Lake Bled as our backdrop, and drove to the castle that is perched on top of a cliff, overlooking the lake. We were some of the first visitors there, and it was nice to have the place to ourselves before the crowd came rolling in. On the drive back to Belgrade, we stopped in Ljubljana, Slovenia’s capital, to check it out — you never know, it just might be on a future bid list! We had been told that it was small but I was still surprised at how small it was. We walked around, did a little shopping, had some pizza, then got in the car for the long part of the drive. Fortunately, no real border lines this time. In fact, the longest line was for leaving one EU country (Slovenia) and entering another EU country (Croatia). How does that make sense? Great post! and gorgeous pics!